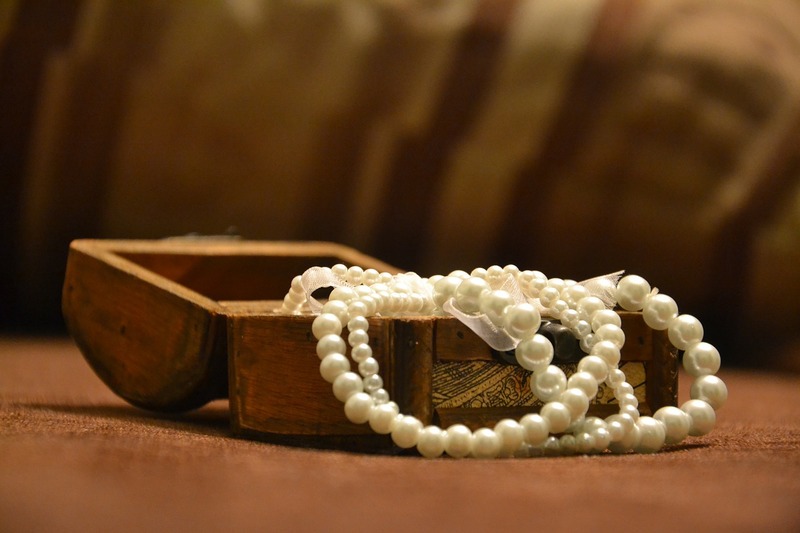 My mother had a pearl necklace that her great aunt had given her. It was one of her prized possessions, hiding in the depths of her jewelry box and only brought out for “special occasions.” Thing is, the special occasions were rather rare for a busy, working mother raising five children. And often, when those “special occasions” would arrive, my mother would forget about her precious pearl necklace, making for another missed opportunity. If you’re the type who covets your jewelry a little too much, first recognize this: it’s normal. These are precious items and nobody wants to lose a family heirloom or have it stolen. We’re cautious because we care, right? But dare to take a look at the flip side: your life is now. Celebrating your prized possessions doesn’t have to wait for a special occasion. It can be any occasion. Dare to wear that special something to a lunch with a friend or a visit to the grocery store or even in the privacy of your own home. Get in the habit of showing off your jewelry now. Today. Remember that a jewelry box is not a home for your jewelry: you are! Our studio staff keep up on fashion advice videos on YouTube. Some are amazingly helpful, some could stand some serious editing…some even contain bad jewelry wearing advice! But there are definitely gems out there. While the music is a bit grating (suggestion: turn the audio off,), we think an all visual video relays pointers more quickly and effectively…don’t you agree? We all know the routine: get dressed and then peruse your jewelry box for the perfect fit to your outfit. But what about changing things up? Think of your favorite pieces of jewelry. What outfits would enhance their beauty? Jewelry deserve time in the spotlight too, right? If you have a statement necklace in your collection, it’s the perfect piece to design an outfit around. Or even those dangly, over-the-top earrings. Then think clothing: bold pieces deserve simple outfits that focus the attention to your overall look correctly. A little black dress would be a good example. But conversely, a dressed down look with jeans and a t-shirt could do the job too. So pull out your “bigger” pieces. Those pieces you don’t tend to wear because they’re a little…much. Then create a look based on it. You’ll be surprised how much a statement you make. What a pleasure to see this delicate Asian influence in jewelry trends this year. Check out some popular pieces featured in Jennifer Heebner’s column in JCK. And remember, if a piece strikes your fancy, we can personalize it and recreate it for a fraction of the cost. Asian influences like origami folds, flowers, and kimono silhouettes were strong on Spring 2013 runways, meaning that jewelers will want to accessorize the looks with complimentary pieces. Think long tassel necklaces or earrings, bamboo and/or cherry blossom themes, jade, Chinese characters, and more. And, don’t rule out homage to the animal of the year per the Chinese calendar: snakes for 2013, and even dragons from 2012 still feel current. How to wear jewelry? Do we really need instructions? In short – yes! I’m sure you’ve seen some jewelry faux pas among the masses and you don’t want to be one of them, do you? This Lucky Magazine video gives you great ideas on necklace layering, wearing large earrings and how to enhance your outfit without overwhelming it. Ready to jump into some custom design jewelry? Take a look at our stunning pink sapphires, just waiting to be transformed into a piece just for you!